Margaret Anderson, a graduate student in the University of Virginia’s Frank Batten School of Leadership and Public Policy, put her advocacy for criminal justice into print, co-writing a well-received book about a noteworthy opponent of the death penalty in Virginia and South Carolina. 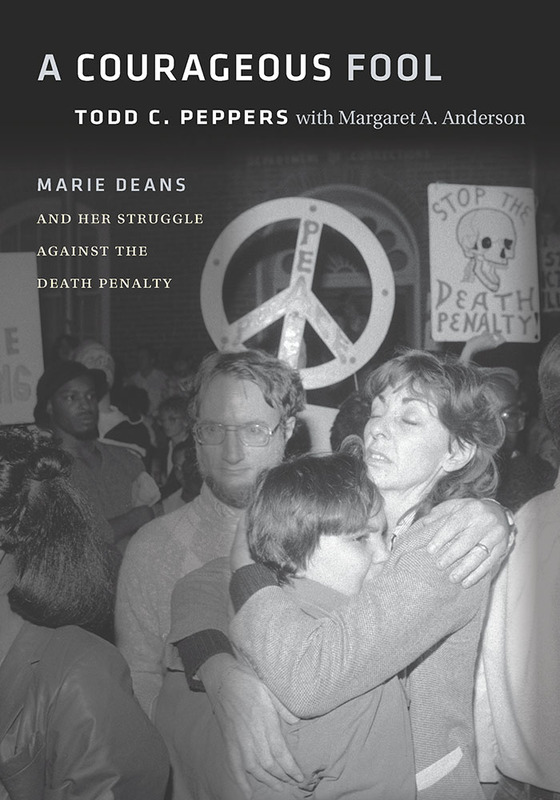 A second-year student in the Master of Public Policy program, Anderson worked with one of her undergraduate professors at Roanoke College to publish “A Courageous Fool: Marie Deans and Her Struggle against the Death Penalty” (Vanderbilt University Press). Their book details Deans’ decades-long fight against capital punishment following the 1972 murder of her mother-in-law, Penny Deans, and the realization that vengeance was not the solution. Marie Deans, a Charlottesville resident who died in 2011, helped win reduced sentences for more than 200 death-row inmates in Virginia and South Carolina. One of those men was Earl Washington, wrongly convicted, who was saved in 2000 from execution in Virginia by DNA evidence. Another, Joe Giarratano, received a conditional pardon and was released on parole last year. Many used to refer to Deans as the “Angel of Death Row.” But Deans said she preferred to be known as a “courageous fool,” someone who was too foolish and stubborn to abandon her struggle to defeat capital punishment. Anderson has attended several book signings since the release last August of “A Courageous Fool,” and she spoke at an anti-death penalty vigil outside of the U.S. Supreme Court last summer. She discussed researching and writing “A Courageous Fool” at a Nov. 1 “Batten Hour” presentation. Anderson’s interest in research, scholarship and writing goes back to her high school days in Madison County. She enrolled at Roanoke College after learning of opportunities there for research fellows and summer scholars. Anderson took Peppers’ courses at Roanoke College and worked as his research assistant. He also encouraged Anderson to pursue an internship in Washington, D.C. Anderson interned for U.S. Sen. Mark Warner (D-Virginia) during the spring semester of her sophomore year. Anderson finished her bachelor’s degree in political science in 2013 and then worked on Democrat Terry McAuliffe’s successful gubernatorial campaign, rising to become a deputy field organizer, managing the Charlottesville office’s interns and organizing volunteers. She then returned to work in Warner’s D.C. office, first as a staff assistant and then as a legislative correspondent, working on agriculture, environment, budget and appropriations-related issues. Since coming to Batten in 2016, Anderson has been a Social Entrepreneurship Fellow and a Batten Ambassador, and she held a summer internship at McGuireWoods Consulting in Richmond. Last fall she worked with nine other students in the “Applied Policy Clinics: Virginia Transition Team Clinic” that assisted with staging the final Virginia gubernatorial debate and advised the transition for then-Gov.-elect Dr. Ralph Northam. Anderson researched and wrote about access to dental care for the transition team. Last fall, Anderson served as a graduate teaching assistant for Ray Scheppach’s “Leadership in the Public Arena” course, and as head graduate teaching assistant for professor Gerald Warburg’s course “The Public Policy Challenges of the 21st Century.” She is also working on an applied policy project on poverty relief in Richmond. “I plan to move to Richmond after I graduate to hopefully work for the state in some capacity,” Anderson said. She hopes that “A Courageous Fool” will serve as a lasting reminder of the relentless work of Marie Deans.